You can share single or multiple forms/surveys with a team on Collect. This will give access to every member of the team. Step 1. Go to the "Form" tab of your Collect account and search for the form you want to share. Step 2. You will be able to view the form now. Next, go to “Audience” tab present above the questions. Step 3. Switch to “Teams”. Now, you will be able to see all the teams in to your organization. Step 4. Select the team(s) that you want to add to this form and then click on the “Give Access” button. Every data collector in this team will be added to this form and can now use it to collect data. 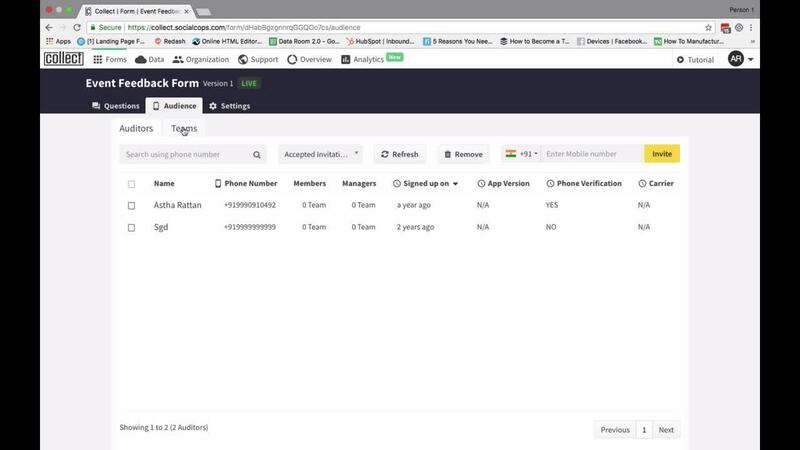 You can also watch the video below to learn how you can share a form with a team on Collect. Please use the full screen mode to view it clearly. Your data collectors will need the Collect mobile application to view the form and submit responses. They can download the app from Google Play Store by searching for " Collect - Data Collection Tool".